Testing water heater thermostats is important in locating water heater problems. The upper thermostat controls both the upper and lower element. When it goes bad you don't have any hot water at all. Not sure if this is your problem? See 'Troubleshooting Electric Hot Water Heaters' or 'Water Heater Element Testing' for other related topics. The lower thermostat just controls the lower element. When the upper element works and the lower one does not you have a low supply of hot water. The thermostats are less likely to be at fault than the elements. However they do go bad and testing water heater thermostats is still required. Your water heater usually has two elements and two thermostats. The upper thermostat has two functions. First it allows the upper element to heat the water in the top of the tank. When this water is hot enough it shuts the upper element off. Then it allows power to go to the lower element. Make sure that the power is off. Turn the temperature to its highest setting on the upper element. This insures that the thermostat will call for heat. You want to use the water heater tester to check terminals #1 and #2 on the upper element (this will be the lower set of #1 and #2 terminals). You should get a glow or light if the contacts are engaging. No light, bummer, the thermostat is bad. 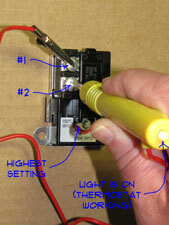 See 'Replacing an Electric Water Heater Thermostat' for instructions on what to do. We are going to get into a weird area here. The next test depends on whether you have simultaneous or non-simultaneous element operation. What! Are you kidding? What does that mean? Most electric hot water heaters are non-simultaneous operation. Meaning that only one element heats at a time. Simultaneous means that both elements can heat at the same time. How do you tell the difference? First simultaneous operation requires a bigger breaker and heavier wire. 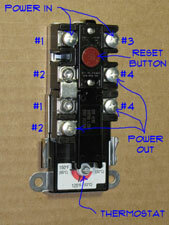 You will likely have a 45 or 50 amp breaker for your hot water heater. Non-simultaneous will only have a 30 amp breaker. Second a non-simultaneous water heater will have a lower #4 terminal on the upper thermostat. Simultaneous operation will not have the second #4 terminal. Is the water heater element testing thing confusing or what? Assuming that you have non-simultaneous operation, continue with this paragraph. Next you need to check the contacts that control the lower element. You want to set the temperature on the upper thermostat to it's lowest setting. Turn it until it clicks off. This should insure that upper element is not calling for heat. This will only work if the water in the tank is warm. With ice cold water the test will fail. We are talking about process of elimination here. Is the upper element good? Do you have power to the elements and thermostats? The water is not heating? 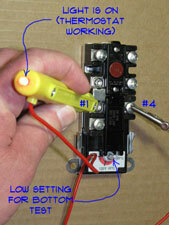 Replace the upper thermostat, see the link in the previous paragraph. Use the tester on terminals #1 and #4 (remember, the lower #1 and #4). Again the light should come on or glow. No light, time for a new thermostat. To check the lower thermostat you need the upper thermostat turned off. The lower thermostat needs to be turned to its highest setting. This should insure that lower thermostat is allowed to engage. 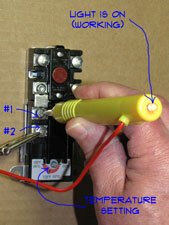 Use the water heater tester to check terminals #1 and #2 (the lower set). The whole simultaneous dissertation does not matter for this one (boy, what a relief). You should get a glow or a light if contact is made. No light, then the bottom thermostat is bad.